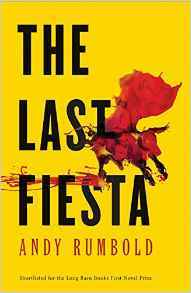 The Last Fiesta follows the friends hedonistic journey through the stunning Basque country, up into the Picos de Europa and finally to Pamplona, for the running of the bulls. But under the blistering Spanish sun, dark truths from the past emerge, and dreadful revelations entwine their lives in a way that will ultimately lead to disaster. Andy Rumbold’s eloquent and evocative first novel was shortlisted for distinguished novelist Susan Hill’s Longbarn Books First Novel Award.